Normalizer creates one or more output records from each single input record. Input records do not have to be sorted. Normalizer does not propagate metadata. Normalizer does not have any metadata template. Normalizer does not require any specific metadata fields. Normalize  The definition of the way how records should be normalized, written in the graph in CTL or Java. The name of an external file, including the path, containing the definition of the way how records should be normalized written in CTL or Java. Normalize class  The name of an external class defining the way how records should be normalized. Definition of the action that should be performed when the specified transformation returns some Error code. See Return Values of Transformations. The URL of the file to which error messages for specified Error actions should be written. If not set, they are written to Console. Normalizer requires transformation. The transformation can be defined in CTL (see CTL Interface) or in Java (see Java Interface). The transformation is defined using several functions. Each of them has its own purpose. The order of function calls is depicted in diagram below. The number of calls of transform() function depends on the result of the count() (or countOnError()) function. The transformation written in CTL uses a CTL template for Normalizer. Only the functions count() and transform() are mandatory. Other functions are optional. Once you have written your transformation, you can also convert it to Java language code using the corresponding button in the upper right corner of the tab. Description Initializes the component, sets up the environment, global variables. The returned number defines the number of new output records that will be created by the transform() function. If the count() function returns 0, the subsequent call of transform() is skipped (transform() is called zero times). For each input record it generates the number of output records that will be created from this input. 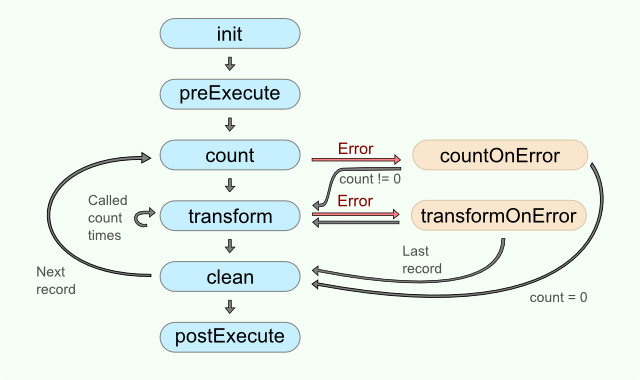 If count() fails	and user has not defined any countOnError(), the whole graph will fail. If any of the input records causes the count() function to fail, and if user has defined another function (countOnError()), processing continues in this countOnError() at the place where count() failed. The countOnError() function gets the information gathered by count() that was received from previously successfully processed input records. Also the error message and stack trace are passed to countOnError(). Integer number. The number corresponds to the return value of transformation. See Return Values of Transformations. Called repeatedly, once for each output record. The number of calls is defined by return value of function count(). If transform() fails and the user has not defined any transformOnError(), the whole graph will fail. If any part of the transform() function for some output record causes fail of the transform() function, and if user has defined	another function (transformOnError()), processing continues in this transformOnError() at the place where transform() failed. The transformOnError() function gets the information gathered by transform() that was received from previously successfully processed code. Also the error message and stack trace are passed to transformOnError(). Called repeatedly, once for each input record. The function is called after the corresponding call(s) of transform() function. The returned number defines the number of new output records that will be created by the	transform() function. If the count() function returns 0, the subsequent call of transform() is skipped. Invocation Called if count() throws an exception. If any of the input records causes fail of the count() function, and if user has defined another function (countOnError()), processing continues in this countOnError() at the place where count() failed. Returns Integer numbers. For more information, see Return Values of Transformations. If any part of the transform() function for some output record causes fail of the transform() function, and if the user has defined another function (transformOnError()), processing continues in this transformOnError() at the place where transform() failed. The transformOnError() function gets the information gathered by transform() that was received from previously successfully processed code. Also the error message and stack trace are passed to transformOnError(). Called in any time specified by the user (called only when either count(), transform(), countOnError(), or transformOnError() returns value less than or equal to -2). May be used to allocate and initialize resources required by the transform. All resources allocated within this function should be released by the postExecute() function. Should be used to free up any resources allocated within the preExecute() function. Input records or fields are accessible within the count(), countOnError(), transform() and transformOnError() functions only. Output records or fields are accessible within the transform() and transformOnError() functions only. The transformation implements methods of the RecordNormalize interface and inherits other common methods from the Transform interface. See Common Java Interfaces and Public CloverDX API. Initializes normalize class/function. This method is called only once at the beginning of normalization process. Any object allocation/initialization should happen here. Returns the number of output records which will be created from specified input record. Called only if count(DataRecord) throws an exception. idx is a sequential number of output record (starting from 0). For detailed information about return values and their meaning, see Return Values of Transformations. In Normalizer, only ALL, 0, SKIP, and Error codes have some meaning. Called only if transform(DataRecord, DataRecord, int) throws an exception. Finalizes current round/clean after current round - called after the transform method was called for the input record. Input records contain group name and list of users of the group. Convert records into tuples having group name and one username. Define the transformation using Normalize attribute. If the transformation is specified in an external file (with Normalize URL), we recommend users to explicitly specify Normalize source charset.